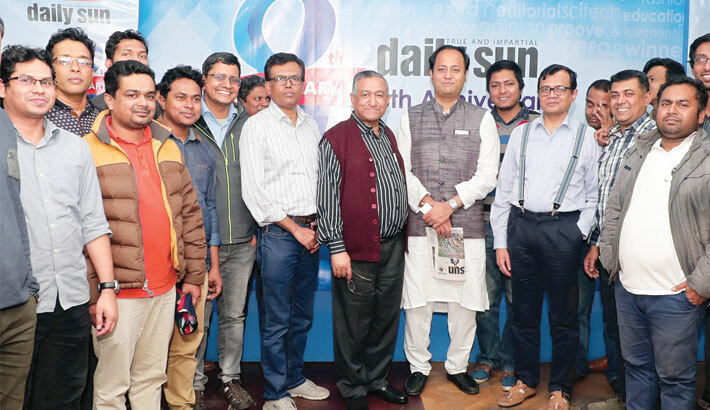 Daily Sun is playing a courageous role in the field of journalism in Bangladesh, newly elected lawmaker Mahibul Hasan Chowdhury Nawfel said. Nawfel, also organising secretary of Awami League, came up with the remark during a meeting with Daily Sun Editor Enamul Hoque Chowdhury at his office at Bashundhara Residential Area in the capital. He was elected from Chattogram-9 constituency in December 30 polls. Daily Sun congratulated the lawmaker, who is going to take oath today, on his election to parliament. The Daily Sun Editor also explained the activities of the English newspaper to Nawfel and introduced the staff members of different sections of the newspaper to the legislator.